$198 Roof & Gutter Tune-Up. Your roof is your home's greatest defense from the elements. As the years go by, it will take a beating. However, it can be hard to determine just how much damage your roof has taken. 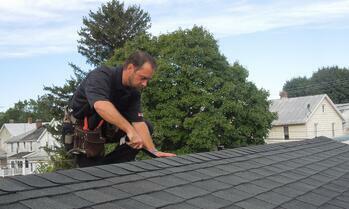 Often, your roof and gutters only need to be touched up, rather than being fully replaced. At AROCON, our $198 Roof & Gutter Tune-Ups (an $870 value) provide homeowners with an immediate fix to their roofing issues, without the hassle of scheduling an estimate. Along with the $198 Roof & Gutter Tune-Up, your Roofing & Gutter Technician will inspect your entire roof and gutters, along with taking before and after pictures and provide you with a Full 21-Point Attic, Roof and Gutter Inspection Report! *Payment is due prior to the tune up. Our technicians do not carry any money. **Tune-Ups Available Only in Maryland. For more details of what you need to know about our tune-ups, CLICK HERE.